The fan and the plastic surrounding the fan can break apart while the bounce house is being used, posing a risk of injury to children. Academy Sports and Outdoors and Sport Chalet stores nationwide from September 2006 through January 2007 for between $200 and $300. 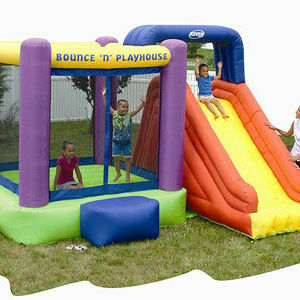 Stop using the recalled bounce houses immediately and contact Sportcraft to receive a free replacement fan. For more information, contact Sportcraft at (800) 511-0675 between 9 a.m. and 5 p.m. ET Monday through Friday, or visit their Web site at www.sportcraft.com.